May 1 marked the 50th anniversary of the American summit of Mt. 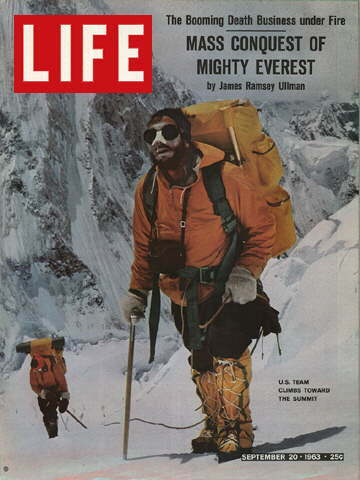 Everest by James W. Whittaker along with Sherpa Nawang Gombu in 1963. This summit success was ten years after Sir Edmund Hillary and Sherpa Tenzing Norgay were the first ones to successfully summit the peak in May 1953. But Whittaker’s summit of Everest was important for America at the time and his success together with the subsequent success of Tom Hornbein and Willi Unsoeld who reached the summit on May 22nd, 1963 helped kindle a fascination with mountaineering and outdoors pursuits in this country. But 50 years later Everest is not the same place it was when Whittaker climbed, when one could not pay a guide tens of thousands of dollars to lead him or her to the summit. And no one could have virtually traversed the route up Everest via Google Earth or, even have imagined doing so. National Geographic together with the American Alpine Club have posted a video just under six minutes listening to the views of Whittaker, other principals in that historic climb and other mountaineers and adventurers on what we gained that May 1963, what we have lost since then and what we still have.